Brightline – which is now known as Virgin Trains – has raised the funding it needs to build a high speed rail line from Miami to Orlando from investors. In the past three weeks, 67 investors have lined up to buy the $1.75B in tax free bonds that had been approved by the state of Florida. That is enough to begin construction on the stretch from Miami to Orlando, and work will begin imminently. Permits and construction contracts are already in place. According to The Bond Buyer, investors were “wowed,” leading the bond sale to be upsized from $1.5 billion. Strong demand also led the bond sale to close a day earlier than expected. The company on Friday won state approval to issue another $950 million in tax free bonds, bringing the total to $2.7 billion. 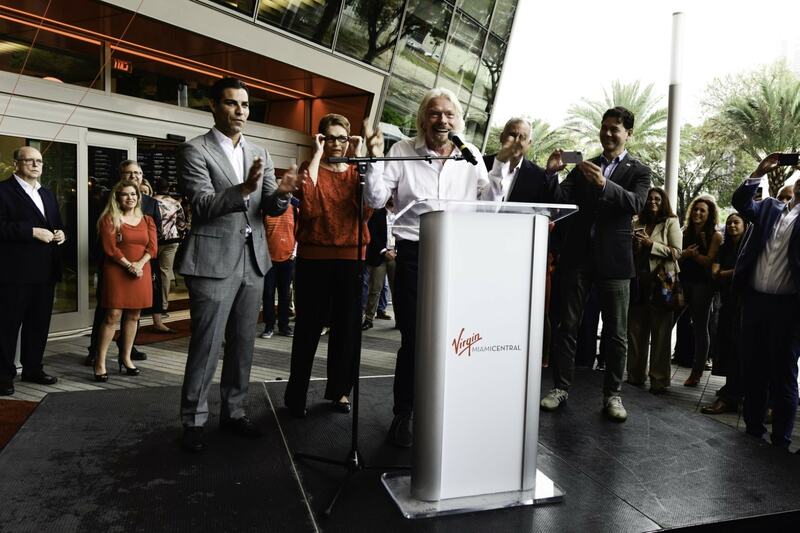 The announcement of funding came at an event held last week where the company was officially renamed from Brightline to Virgin Trains USA. Richard Branson was in attendance. Virgin’s station at Orlando International Airport is already completed. Construction of the rail line from West Palm Beach to Orlando will take 30 to 36 months. Another $100 million may be issued to purchase rolling stock. Some of the investors made in person visits to ride the train, and one called it “a whole new level of train transportation,’” Bond Buyer wrote. The response was said to be overwhelmingly positive. It is NOT high speed rail. True high speed rail (over 200mph) was shut down by the former governor. I wish people would get the facts right before publishing. It would of been like the California high speed rail that is over budget and still under construction. Trains of that speed need dedicated passenger tracks that are completely grade separated – not shared with freight, no vehicle or pedestrian crossings. That could be done on new track sections, but would be impossible on the existing route through heavily populated South Florida. Cost/benefit/politics analysis hopefully indicated this as an optimum choice. Te original proposal would have been along I-95 and/or the Turnpike, which aren’t really areas fit for transit. So funny! Lol, areas around the largest arteries in the state are not fit fr transit. What do you really care. It is a nice train. Let’s just agree on that. There is no hard and fast line for constitutes high speed rail. The industry does have some rules of thumb. Next time your ego wants to crap on the world, take some time to learn what actual experts have concluded. Amazingly, industry experts agree that Bright Virgin is actual high speed rail despite what anonymous numpties spew. Who would’ve thunk, eh? Cool. In a few years I’ll be able to take the train from Miami to Berns steakhouse in Tampa and comeback on the same day. 36 months?! That means not even finishing until at least 2022 and more likely 2023! If you own any of the high priced and beautiful homes along this route, it is definitely time to sell. Not many areas of high priced and beatiful homes next to the FEC tracks. What happened to the MCO link? After building everything, did they just realize it wasn’t feasible, so instead you have to transfer at a station in the middle of nowhere? The train is going to Orlando International. Station is already built. Yes, it will be Killed by the Some Floridians stuck in the 1960s-Suburban-MAGA-Mega-Truck-where is the next Gas Station mentality. You should go full tard and champion horse-drawn chariots. I know, I know trains are anti-American. YOU ARE SO IGNORANT……….LOOK AT Europe, CHINA and JAPAN HIG SPEED TRAINS!!! BEAST! If your business plan depends on the support of racistly disparaging stereotype, you deserve to go out of business. So they’ve got almost $3 billion of bonds, which won’t be taxed (therefore subsidized). Also – who’s backing these bonds? Obviously the company which has sales in the low million $ can’t, are these gov’t backed? I think the answer is yes. A $3 billion boondoggle to the benefit of these “private” investors. Who cares if it’s not public money? Default risk is the problem of the people who bought the bonds. The money is going to infrastructure that will last a long time and is massive contribution to the area. Yep, businesses are piggy backing off these stations and the stations alone are reactivating areas. >Bonds issued by the FDFC are not guaranteed by the State or any local government. Who are they guaranteed by? The Feds? If only by brightline then are the buyers fools? They could certainly be guaranteed only by Virgin/Brightline it happens all of the time with corporations. That’s one of the risks of buying a bond. It’s why corporate bonds have different ratings. The lower the rating / credit quality the higher interest the borrower must pay to compensate for that risk. That was part cause of the mortgage market meltdown in 2008. Investment banks sold complicated bonds backed by pools of mortgages. They got ratings agencies to rate them AAA, but some quickly became worthless when the fan was hit. Did I mention the banks chose and paid the rating companies? If the bonds have a government backing/guarantee, then taxpayers are on the hook for a default to the bond holders. This is cheap. The SMART plan estimates rail to cost 2 billion for 7 miles of track up 27th ave. Maybe Brightline can take over for the incompetence of the bu·reauc·ra·cy we have with the miami politicians. If we are lucky the SMART plan would be delivered in 10 years. Brightline 2 years for 170 miles!